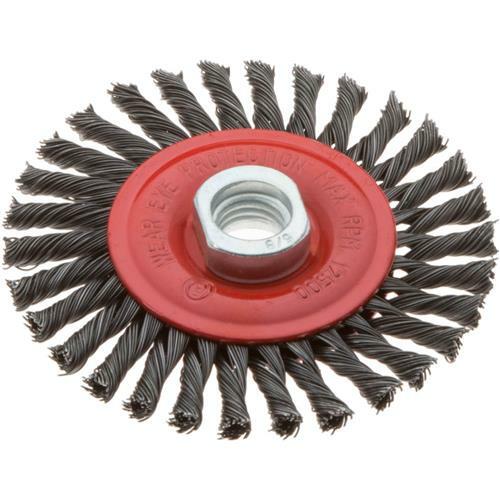 This wheel brush is made of steel wire that's been hardened and twisted into 50 knotted strands to provide a fierce, flexible grinding surface. Use for removing excess rubber from rubber-to-metal bonding parts, as well as adhesive residue, hard scale rust, and paint, and cleaning up welds. 5/8"-11 arbor hole. Bought this product to begin repair on rusty gutters of an old van. Worked well, removing extensive rust. It's the right tool for the job.